The Grunigen Medical Library, established in 1983, is one of the leading teaching hospital libraries in the country, with an impressive 25 year history. Housed in the Forest J. Grunigen, M.D. Library and Medical Education Center at the UC Irvine Medical Center, the library is the largest medical library in Orange County. The library provides access to thousands of journals and books, and an extensive array of bibliographic, reference, image, statistics, and video resources. 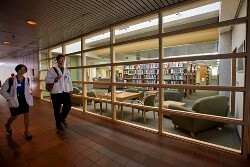 The Grunigen Medical Library serves the educational, research, and clinical needs of health professionals, students and researchers at the UC Irvine Medical Center and College of Health Sciences, and throughout the Orange County region. The Grunigen Medical Library is a Resource Medical Library (RML) for the Pacific Southwest Region in the National Network of Libraries of Medicine (NN/LM).